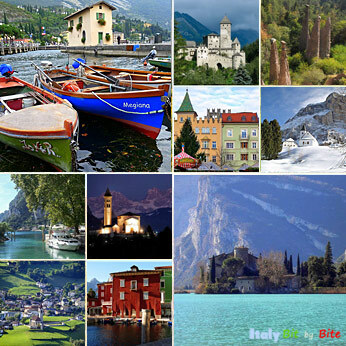 Trentino Alto Adige is located in the most Northern part of Italy bordering Austria and Slovenia. Being in the middle of the Alps, all ski resorts are within a one hour car driving distance. The region offers a remarkable variety of landscapes going from the picturesque shores of Lake Garda and many other lakes to some of the most striking mountain peaks in Europe: the Dolomites of the Fassa Valley, the Gardena and Fiemme Valleys, the Brenta Group and the Pala Group. The Trentino-Alto Adige region is pleasant to visit all year round, whether for a skiing vacation in Winter or for a refreshing retreat in Summer. The area around the lakes is nice to visit in June or September, earlier in the season, during late May and early June, the weather can be very unsettled. Trentino-Alto Adige is also famous for its spa towns: Merano, Bagni di Rabbi, Comano Terme, Campo Ture, Levico Terme, Pejo Terme, Sesto, Terme di Brennero, Vetriolo Terme and Vigolo Baselga. Two autonomous provinces make up the region: Trentino and Bolzano. The Trentino Alto Adige region together with the Austrian region of Tyrol correspond to the historical region of Tirolo to which they are linked for linguistic and cultural reasons. 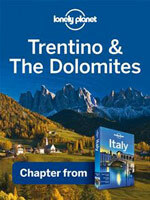 The region is closely linked to the history of the Ladins of the Dolomites. Today, this linguistic and cultural group is spread over three provinces, the two provinces of the Trentino-Alto Adige region and the Belluno province in the Veneto region. Together with the Veneto and Friuli-Venezia Giulia regions, the Trention-Alto Adige region is part of of the macro-geographical area known as the Triveneto. The "road of the five stars" (Percorso delle cinque stelle): the top 5 christmas markets in South Tyrol. Spa towns: Merano, Bagni di Rabbi, Comano Terme, Campo Ture, Levico Terme, Pejo Terme, Sesto, Terme di Brennero, Vetriolo Terme and Vigolo Baselga.